Retail activity posted the strongest gain in five months, as big gains in auto sales and rising gasoline prices helped to drive overall activity. Core spending grew at a more moderate pace, but the broad-based nature of the gains is encouraging headed into the holiday season. The Census Bureau reported this morning that total retail sales rose 0.8% in October on a seasonally-adjusted basis from September’s levels, exceeding consensus estimates of a 0.6% gain. 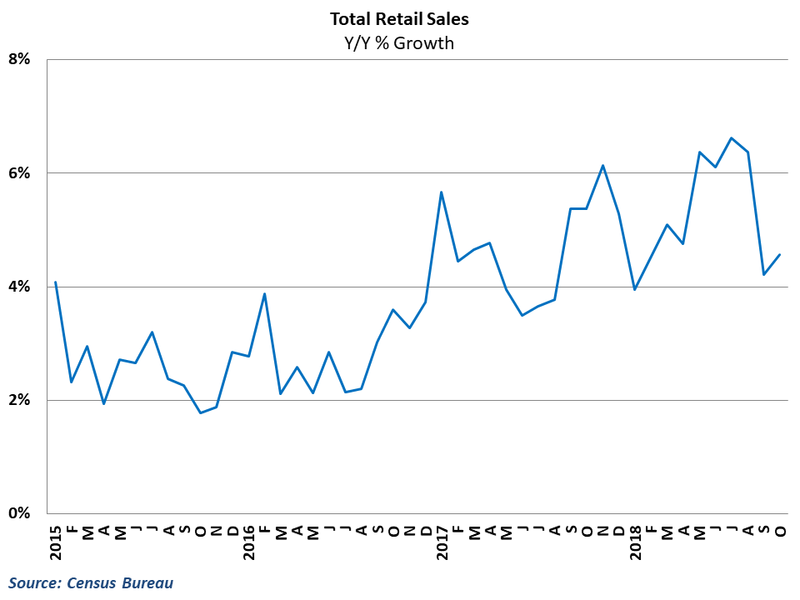 This comes on the heels of downwardly-revised declines in both August and September and marks the fastest pace of growth in the retail sector since May of this year. Year-over-year for total sales climbed to 4.6% after tumbling to 4.2% in the previous month. More than one third of the gain during the month was driven by a 3.5% gain in gasoline sales in October. Retail sales figures are nominal measures, and a rise in gas prices in the early part of the month inflated the sales figures at gas stations. Auto sales also posted an impressive 1.1% gain in October, bouncing back after a slight decline in the previous month. Core retail sales excluding autos and gas rose by a more modest 0.3% during the month but are still up 4.7% from this point last year. Growth during the month was generally broad-based, with only furniture stores and restaurants registering declines. Building material stores led the way among core retailers, in a sign that hurricane rebuilding efforts may have driven some activity. Electronics stores, clothing retailers, and department stores also enjoyed healthy gains in October and look to maintain this momentum headed into the holiday season. This bodes well for retail performance going forward, and should help propel freight demand in upcoming months. Consumers in the economy continue to be supported by strong job and income growth, and inflation remains generally tame. U.S. households appear to have weathered many of the disruptions from hurricanes and stock market fluctuations over the past couple of months and look to be in a good position to spend going forward. The headline retail number was pretty impressive, but the big gains in gas and autos are not likely to continue going forward. Oil prices tumbled throughout October, and this has already translated into lower gas prices so far in November. As a result, the gain in gas sales in October will likely turn into a similar-sized reversal in next month’s numbers. The big jump in auto sales is likely just a blip in what has otherwise been a disappointing year for the auto sector. Even with the surge in October, auto sales are down year-over-year and will likely continue along this trajectory going forward. The rest of the retail picture looks healthy still. Holiday sales, which exclude autos, gasoline, and restaurant purchases, should see strong growth this year though the downward revisions to August and September have weakened the outlook. We still expect holiday sales to grow near 4.5% this year, and the retail environment should remain one of the highlights in the economy as long as the trends in hiring and wages hold up.